Do you dream of your own home on the lake with private settings and beautiful surroundings? Give us a call at Mountain Home Properties. We specialize in Asheville lake real estate and can show you properties located on Lake Junaluska and Biltmore Lake, two of the lakes in our lovely county, or lake property on one of the many beautiful lakes in the surrounding areas. Lake Junaluska is located just a half hour away from Asheville NC in Waynesville, one of Western North Carolina’s picturesque small towns. Known for being the gateway to the Great Smoky Mountains, Lake Junaluska has pristine, inviting waters and many beautiful lake communities. Located in Haywood County, Lake Junaluska is just one of the lakes in the county offering plenty of fun recreation on the water. Named for the famous family and North Carolina’s famous estate, Biltmore Lake is a beautiful 62-acre lake in Buncombe County, surrounded by hiking trails, campgrounds, a full swimming sand beach, and two planned communities. Lake Village on Biltmore Lake and Scott Ridge are both well developed neighborhoods with beautiful homes, plenty of recreation, and excellent schools. Learn more about the fabulous lifestyle you will find on Biltmore Lake. If you are looking for beautiful Asheville NC lake real estate, let us help you look into homes and neighborhoods on Biltmore Lake. Just 40 minutes from Asheville is Lake Adger, which is surrounded by several small, private communities. The developments along Lake Adger paid special attention to the natural landscape during development making the neighborhoods beautifully designed and pristinely kept. With a 438 acre surface area, Lake Adger offers plenty of water recreation for those who enjoy boating, fishing, swimming and spending their free time on the lake. Learn more about the private home sites and gorgeous neighborhoods around Lake Adger and Polk County. Lake Lanier is also located in Polk County near the areas of Tyron and Landrum, SC. Built in the 1920’s, Lake Lanier is a haven for those lucky enough to have vacation homes on the lake and is beautiful year round for full time residents. Lake Lanier is more of a secluded, private lake for those seeking peace and solitude. One of the more famous lakes in Western North Carolina, Lake Lure is a popular weekend destination for those living in other areas of Western North Carolina. Located in Rutherford County, Lake Lure is a bit further away from Asheville NC, but offers residents and second home buyers plenty of seclusion and beauty in the Blue Ridge Mountains. With its 720 acre surface area and 20 miles of pristine, wooded shoreline, Lake Lure is known for being one of the most beautiful locations in the south. Made famous by the movies Dirty Dancing and Last of the Mohicans, Lake Lure is a place you simply must visit. Discover the many cozy cottages and lakeside villas located along Lake Lure. There is an abundance of lake front homes and waterfront properties for sale in and around Asheville NC, and the area offers excellent lake communities and an alternative to living close to the city. 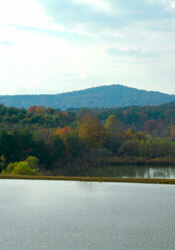 Let us at Mountain Home Properties help you buy lake real state near Asheville NC and find your own slice of heaven.